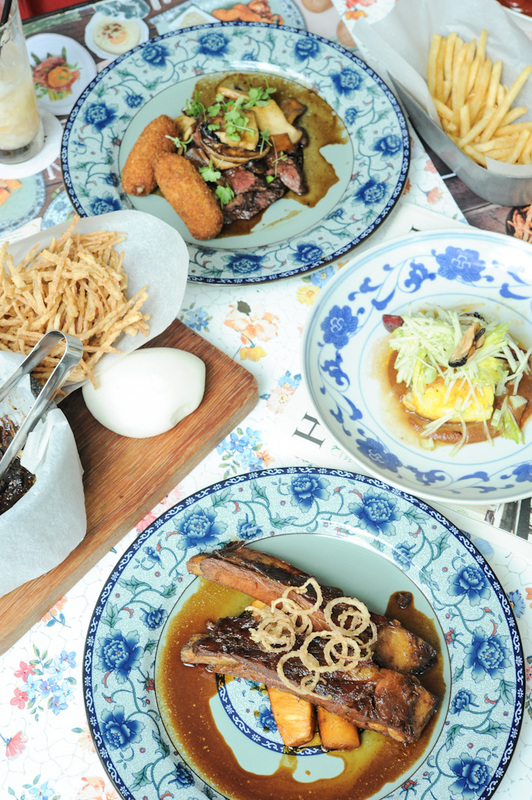 Singapore F&B scene has been very exciting over the past few years. There is always a new place opening almost every week. There are so many new and cool restaurants that I find it hard to keep up. While I love checking out the latest hip place in town – it is, after all, my job to do that – sometimes, I just like to go somewhere familiar. One of my favourite restaurants in Singapore is House at Dempsey Hill. House may already be very popular, but it is a shame that it remains as one of the most under-rated restaurants around. It is not easy to create a cosy ambience with vibes so chic. Yet, House managed to do it so effortlessly. Mismatched furnitures, spacious layout with low ceilings and sporadic partitions, dim lights complementing the sun rays that stream in from the ceiling-to-floor glass panels, soft jazz and lounge music looping while the coffee machine brews and the wine glasses clink intermittently; there is this unassuming comfort that makes sitting here all too indulging. The folks at House have recently launched a new menu – its first major overhaul in six years. The food is still very much the same – simple comfort fare that you can eat on a regular basis. And now, we are in for more new additions. We started with the Asparagus, Serrano Ham and Crumbed Egg $22. This classic combination never fails to please. In addition to the legendary truffle fries ($11), Barracks Café has also introduced some new variations in the form of Pumpkin hazelnut fries ($12) – shoestring pumpkin fries with crunchy hazelnut, paprika and chilli powder; Truffle Taro Fries ($7) – straw cut yam fries with aromatic truffle oil; Curry Mustard Fries ($9) – shoestring fries topped with paprika, curry and a sprinkle of sea-salt; and Carrot Fennel Fries ($9) – straw cut sweet carrot fries with a sprinkle of fennel. An old favourite that has its place standing firm on the menu is the Asian Sliders, also known as Kong Ba Bao. House’s rendition is easily one of the best around. Braised lean pork belly tucked in steaming hot buns, and complimented with crispy taro fries. In a word: perfection. The Hanger Steak ($27) with croquettes and wild mushrooms was also a crowd-pleaser that afternoon. A perfectly seared steak so affordable, I would go back to House just for this. If you are like me, a fan of risotto, you have to try the new Pumpkin Risotto with brown butter reduction and toasted pumpkin seeds. The Roasted Chilean Cod Fish, with a refreshing apple and celery salad, was extremely fresh, but we did not fancy the sweet date sauce that came along with it. If you still have room, you should go for the Pork Ribs with Caramelised Pineapple ($27). While the meat was not off-the-fork-tender, it was still very flavourful and delicious. House did not make any changes to the desserts menu, so you can still find the popular favourites such as their Warm Strawberry Shortcake ($9.50), Carrot Cake ($7), and Warm Chocolate Toffee Cake ($9.50). The Bitter Chocolate Tart ($7.50) was amazing. Now, I hardly use the word ‘amazing’ to describe desserts, but House’s version completely won me over. It was bitter, sweet and done just right. The Lemon Ricotta Cheesecake ($7.80) impressed, too, with its creamy and cheesy flavour, and the addictive biscuit base. The only dessert that I did not enjoy was the Warm Banana Salted Caramel Cake ($7). While the use of popcorn in a dessert was interesting, the cake was somewhat lacking in flavour and depth. we gave your recommendation a try, a miss would have been better. Environment good, everything else bad. LadyIronChef PLEASE BE MORE OBJECTIVE! was there today – really overrated place. We tried the eggs benedict, one of those pizza dishes and the truffle french fries – none of it was worth the price. I must add, that the eggs benedict were the worst one I have eaten so far. A pro is the whole layout of the café/restaurant. I beg to differ from all these negative comments. I think the LadyIronChef is spot on, what a great place ! The atmosphere and layout of the restaurant is planned superbly and it creates a very cosy like vibe. The Hanger Steak is quite amazing considering the price and the truffle fries is always a winner ! Wow! The lemon ricotta cheesecake is so expensive at $78!